Coconut - 1 medium cup. Cashews - 5 (for Seasoning). First cook the rice upto 2 whistles in a pressure pan. Do not over cook. Keep it aside and let it cool. In a small pan, preheat a drop of oil and fry the ingredients of spicy powder one by one and let it cool. Grind it into a fine powder. Keep it aside. Now in a big pan, pre heat the remaining oil, add mustard seeds when it splutters, add, channa dal +uriddal+green chillies+ fenugreek seeds+ peanuts+ cashews+ red chillies+curry leaves, one by one and fry it to golden brown. Finally add the fresh coconut to it and turn off the stove. Do not burn these ingredients. Add salt to it and stir it thoroughly. Now pour these ingredients on top of the rice and stir it carefully till the rice mixes with coconut etc. mix. Do not mash the rice. At last sprinkle one or two tbsp(acc. to taste) of spicy powder on top of the rice and mix it thoroughly. Again, do not mash the rice while using a spoon or spatula. The above said quantity will be enough for 2 to 3 people. This curry powder can be used for all kinds of curries(side dishes). The main ingredients are as follows. In a wide pan, fry these ingredients one by one and let it cool. Grind it and store it. This powder can be used for all kinds of curries like potato curry, Okra curry, Long beans curry, Beans curry, Taro root (chepankizhangu) curry, sweet potato curry etc. If we wish, we can also fry a hand ful of curry leaves with all the above said ingredients and grind it along with the ingredients. In a pan, add a cup of water to cut tomatoes, mix the tamarind paste or tamarind. 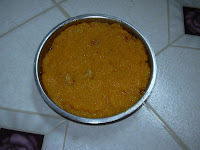 Add turmeric powder, rasam powder and salt to it. Let it cook/boil for 10 mts. Now add the toor dal and another cup of water to it. 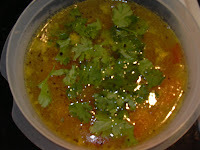 When the rasam starts emitting a very good aroma, turn off the stove. In a small pan, pre-heat the oil/ghee, add mustard seed, when seeds start splutter, add Vepampoo, fenugreek seeds and asafoetida and curry leaves to it. Pour it in the rasam. Garnish it with fresh coriander leaves. 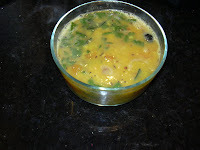 Its always better to eat this Rasam after few minutes of cooking, so that the aroma of neem flower mix with rasam. In a pan, add a cup of water to cut tomatoes, mix the tamarind paste or tamarind. 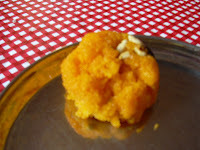 Add turmeric powder, rasam powder and salt to it. Let it cook/boil for 10 mts. Now add the toor dal and another cup of water to it. When the rasam starts emitting a very good aroma, turn off the stove. In a small pan, pre-heat the oil/ghee, add mustard seed, when seeds start splutter, add fenugreek seeds and asafoetida and curry leaves to it. Pour it in the rasam. Garnish it with fresh coriander leaves. Serve it hot with rice. In a wide pan, fry these ingredients one by one to golden brown and let it cool. Now grind these ingredients and store it. Wash and cut all the vegetables into 1" size. Cook the vegetables in a big pan with turmeric powder, salt and 1 tbsp of coconut oil. Do not over cook. Its better to add the vegetables one by one according to its cooking time. Now grind the coconut with green chillies without adding much water to it. Drain the vegetables if there is more water. Now add the coconut chilly paste to it and stir it thoroughly so that the vegetables get coated with the paste. 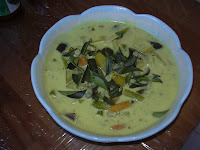 Now add the curry leaves, coconut oil to it and mix it. Mix it carefully. Do not the mash the vegetables while mixing. Turn the stove off and now add the beaten curd to it. Again mix and take it out of the stove. This avial can be a good side dish for Adai, Chapathi or poori. Since the number of vegetables used is more, we need only less in each of them. This can be used for 2 days under refridgeration. 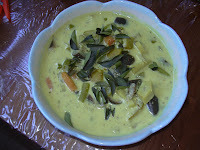 In my house, my mom and patti make this avial as a main dish. 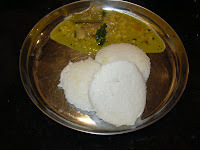 In that case, we have to add a little more beaten curd or water to make the avial in a watery consistency. 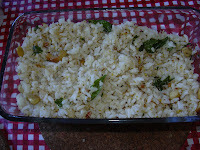 In my in laws place, we use it as a side dish for Kalantha saadam (variety rice). My Mother in law use a teaspoon of cumin seeds with coconut and green chillies, for grinding.